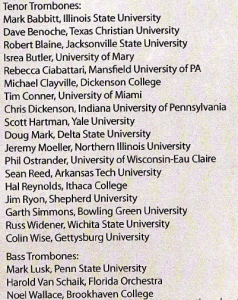 The International Trombone Festival was held at the Eastman School of Music in Rochester, NY this year and I had the good fortune to be able to attend and perform. The festival was packed with events (literally; at times there were as many as five things happening at once) leaving an attendee with a dilemma regarding which to attend. I did my best to catch as much as possible but try as I might I eventually became overwhelmed and needed to catch a breather for a time. What I did see left me inspired, motivated and intrigued. I’ve compiled some of my notes from the event. First let me thank Newell Sheridan, of Sheridan Brass, for helping make Novus’s appearance at the ITF possible. Check out his website to get a sense of the type of businessman he is, kind of refreshing to see. He stocks only Shires Trombones and his own creation the “Get-a-Grip” hand brace, a very useful tool. I arrived a bit on the late side and made a bee-line for Abbie Conant‘s performance. I’ve seen her perform once before (in 1998 at Mannes) and her control, endurance, musicianship and creativity made a lasting impression. I was excited to see her again. She performed Street Scene for the Last Mad Soprano, a theatrical work in which her trombone playing is minimalized (but astounding) and her singing and acting ability are brought to the fore. You can get the concept of the work from the program above. The work is about fifty minutes long and without consistent meter and tonality. Ms. Conant picked pitches out of time and range with ease (check the score to see what she memorized). The musical effect is astounding. It’s a true testament to her musical ability on the trombone and off. That evening I caught the first half of the Great Lakes Trombone Ensemble performance. Excellent playing, standard repertoire. Took my leave at intermission to work with Mike Selover on the music for our performance on Saturday. Began the day with a warmup on my own and a conversation with Bruce Lee of Facet Mutes. Have to say, those mutes were great. Absolutely great. 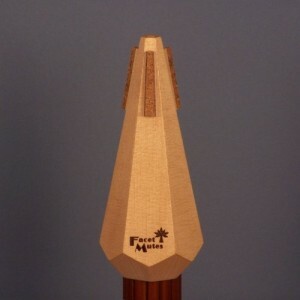 I’ve written about response problems on other mutes, The Facet Mutes had none of the normal issues. Low to high register they were extremely consistent. I’m confident in recommending them to anyone. Matt Guilford‘s presentation “Size Matters, but It’s the Little Things That Show How Big You Are!” was next. Matt began his talk with a dramatic reading from Berlioz’s orchestration book, naturally the section regarding the trombone. 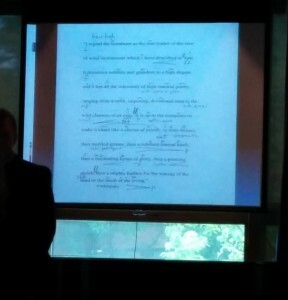 He then showed how he had notated the text like a musical score with articulations and dynamics. He spoke about how in his (sizable) teaching and playing experience everyone is looking for a “bigger” sound… but these people generally find a good sound and need to start thinking about the “little” things… like articulations and dynamics. He mentioned the value of life experience and how there’s no substitute or way to gain it without living it. He played the opening of the Hindemith Sonata as an example of a piece without expression markings, the Grøndahl Concerto as an example of a piece with lots of markings and the Saint-Saëns Cavatine as an example of a piece with some markings. 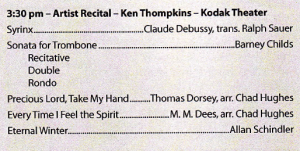 The next thing I caught was Ken Thompkins recital. Damn. Ken demonstrated some incredibly controlled, nuanced playing on some varied and difficult repertoire. His performance was in the gigantic Kodak Theater not the easiest space in which to play solo but he did so to great success. That was it for the day for me. I spent the rest of the evening rehearsing. Friday began with the Penn State Trombone Choir and Ken Thompkins’s masterclass on practice strategies. Penn State performed music from Shostakovich’s Festive Overture arrnaged by Mark Lusk and the Verdi Requiem arranged by Brad Snyder, a student in the choir. Mark Lusk, Penn State trombone professor, gave the ensemble empty folders at the beginning of the school year and informed the students that any music they would play that year would be written, arranged or transcribed by them. This piece was a result of that project. Brad arranged the trombone choir in three groups, the largest served as the vocal choir, the orchestra was represented by six trombonists and the vocal solo parts were done by four trombone players. There was a wealth of great material but I ran out at the very end to catch some of John Kenny‘s masterclass. I got there in time to hear John talk about multiphonics and split tones. He talked about the difference between vocal ranges for men and women and how composers should take that into account when writing multiphonics. As for split tones he talked about “finding the click between two harmonics.” He demonstrated by slurring from B flat down to F and stopping when he had both tones simultaneously. One thing he said resonated especially with me: in reference to split tones and strange things in general he said the twentieth century was about “observing things that are not desired and making them desirable.” Seemed pretty dead on to me. I caught John Kenny’s recital after lunch. Followed by part of Jörgen van Rijen‘s. What I saw of Jörgen’s performance was fantastic. Like Abbie Conant I had heard him play years ago (at the ITF in Utrecht in 2000) and was floored. His performance here was just as impressive. It’s great to see and hear someone with fantastic musicality and an interest in doing things outside the traditional repertoire. That evening I rehearsed with the Cramer Choir and got ready for the long day to come. We performed music by Franck and Vollrath and a new work by Kim Scharnberg that was written to celebrate John Marcellus’s career at the Eastman School of Music. For Kim’s piece I did a rendition of the Pledge of Allegiance through the trombone a la Robert Erickson’s General Speech. We finished the concert with the current Eastman students who are graduating with a performance of Ralph Sauer’s new arrangement of the Adagio from Saint-Saëns’s Third Symphony conducted by John Marcellus. Doc was in prime form and his musicality transferred to the ensemble. There were tears. I really hope someone recorded that. Then came the concert with Novus. We prepared a fifty minute performance with brand new and not-too-old repertoire. 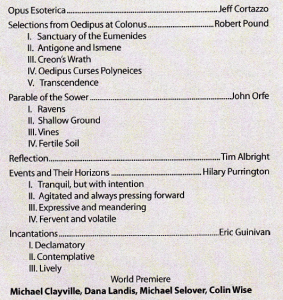 Our performance may have been the only not double-booked for the festival and we had a great audience. Thanks to all who attended. I truly hoped you enjoyed it. The final concert of the festival was that evening and featured Bret Baker, Ian Bousfield, Matthew Guilford and Jim Pugh performing with the Eastman Wind Ensemble. That wasn’t the end of the trombones. Sunday morning I headed to Riverside Cemetery with about twenty others to pay respects to Emory Remington. In an event organized by Ralph Sauer and Gordon Cherry, trombonists gathered, warmed up, listened to Ralph play the Sarabande from the fifth Bach Cello Suite, played O Sacred Head and the Adagio from Saint-Saëns Third Symphony and listened to stories about “the Chief.” It was an indescribably powerful event, one that I feel fortunate to have participated in. 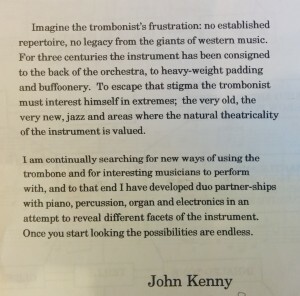 Gordon spoke of Remington’s lasting contribution to creating the trombone “community.” The ITF was definitely an extension of that. The people I met and old acquaintances I reconnected with made the week truly special. I can’t put into words all that I experienced at the festival but hopefully what I can share is useful to the community. This entry was posted in Uncategorized on June 24, 2014 by novus.